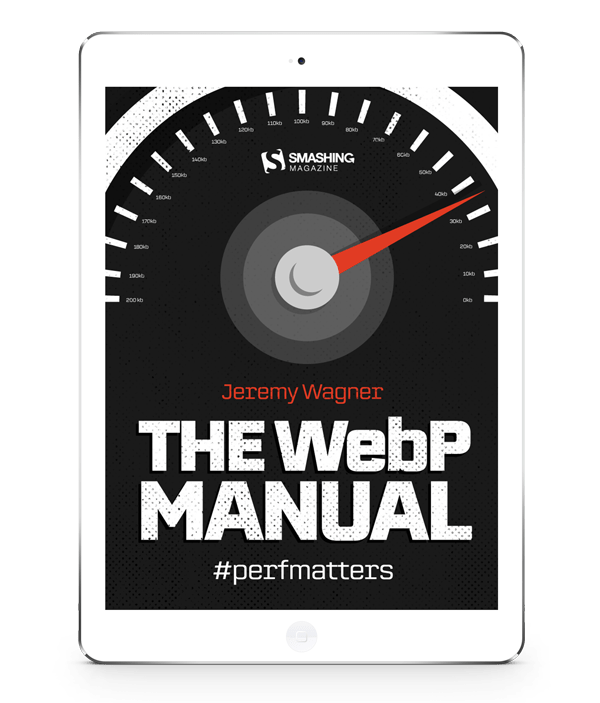 Meet The WebP Manual by Jeremy Wagner, a new Smashing eBook on everything WebP: what it’s good for, how lossy & lossless variants perform and how to use WebP properly. PDF, ePUB, Amazon Kindle. Read an excerpt. What’s WebP in the first place? Can we actually use it today? And if yes, how exactly? The role of media in performance, specifically images, is of huge concern. Images are powerful. Engaging visuals evoke visceral feelings. They can provide key information and context to articles, or merely add humorous asides. They do anything for us that plain text just can’t by itself. But when there’s too much imagery, it can be frustrating for users on slow connections, or run afoul of data plan allowances. In the latter scenario, that can cost users real money. This sort of inadvertent trespass can carry real consequences. Looking for a sneak peek? Read an excerpt. 84 pages. Written by Jeremy Wagner. Cover Design by Ricardo Gimenes. Available in PDF, Kindle, and ePub formats. ...along with 12 webinars and 56 other eBooks. WebP images usually use less disk space when compared to other formats at reasonably comparable visual similarity. Depending on your site’s audience and the browsers they use, this is an opportunity to deliver less data-intensive user experiences for a significant segment of your audience. We’ll cover how both lossy and lossless WebP compare to JPEGs and PNGs exported by a number of image encoders. This can be done in a myriad of ways, from something as simple as exporting from your preferred design program, by using Cloudinary and similar services, and even in Node.js-based build systems. Here, we’ll cover all avenues. Because WebP isn’t supported in all browsers just yet, you’ll need to learn how to use it that sites and applications gracefully fall back to established formats when WebP support is lacking. Here, we’ll discuss the many ways you can use WebP responsibly, starting by detecting browser support in the Accept request header. 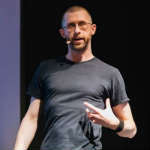 Jeremy Wagner is a performance-obsessed front-end developer, author and speaker living and working in the frozen wastes of Saint Paul, Minnesota. He is also the author of Web Performance in Action, a web developer’s companion guide for creating fast websites. You can find him on Twitter @malchata, or read his blog of ramblings. Learn how lossy and lossless WebP compare to JPEGs and PNGs exported by a number of image encoders. Learn which services and plugins you can use to export or convert images to WebP with your preferred design tool or command line tool. Learn how to can use WebP in production, and how to implement proper fallbacks for browsers that don’t support WebP just yet. 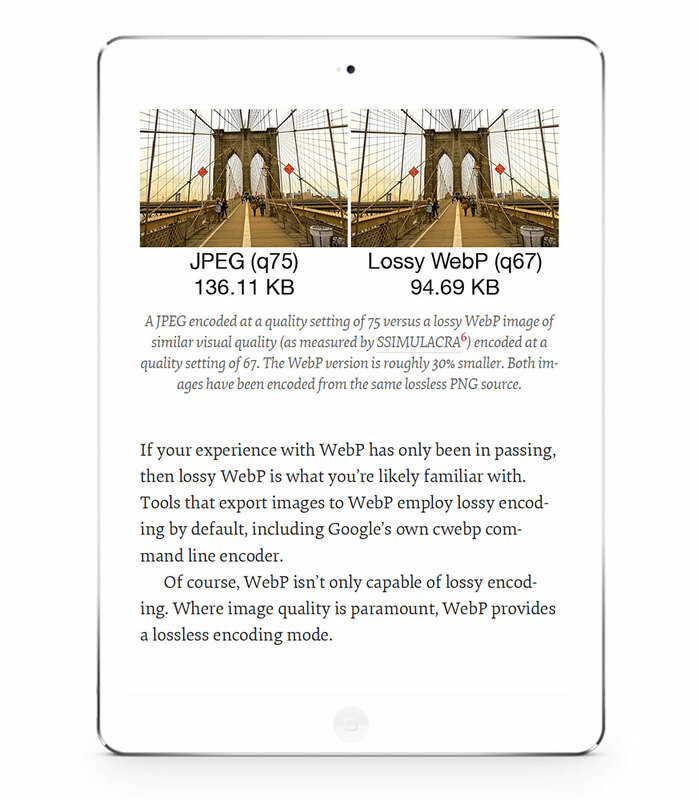 Learn how to use the full potential of the WebP format. It will substantially improve loading performance for many of your users, customers, and clients, and it will become one of your favorite tools for making websites as lean as possible.